Once a year, all the sheep in the glen get together to compete in the Highland Games. It is always great fun and this year promised to be the same. Today’s main events were Sheep Jumping, Haggis Eating, Sock Knitting, and everyone’s favorite, the Highland Fling. Other less popular events, such as, Bluebell Ringing, Thistle Picking, and River Walking, took place throughout the day. The sheep started showing up, each dressed in their flock tartan. The first sheep to arrive were Brodie and Florrie, participants in the Sheep Jumping event. Small fences had been placed all around the edge of the meadow. Many other animals of the glen, such as deer, fox, and hare, had found a place to sit in the center, to get the best view. Keith, a large ram, was to be the judge. Brodie and Florrie stood at the starting line. Keith let out a loud ‘BAA’ and the two sheep were off. They hopped over the first fence. Keith counted ‘one’. They leapt over the second fence. Keith counted ‘two’. By the time they’d reached the tenth fence, Keith was asleep. He had fallen down on the grass and was snoring as the two sheep ran and leapt. They didn’t know when to stop, as Keith wasn’t awake to do the stop ‘BAA’. After twenty times around the meadow, all the other animals that were watching were asleep. It’s not easy counting sheep. Brodie was so tired that he tripped on a fence post and Florrie, too tired to leap another fence, just stood there. About that time, Keith woke up. He saw Brodie lying on the ground and Florrie standing at a fence. He didn’t know whom to call as winner, as he’d been sleeping, so he called them both over and announced it was a tie. In another part of the glen, tables had been set up for the Haggis Eating Games. Calum and Ramsay, two large rams, had bibs tied around their necks, ready to eat. Nellie, a ewe, sat across from them. She was the judge - the counter of the haggis. Crowds gathered around, eager for the Games to begin. The first plate of steaming haggis was brought out and placed on the table in front of the two sheep. Calum sniffed it. He wasn’t particularly fond of haggis but had starved himself for two days so he’d be really hungry. He was so hungry right then that he’d eat anything, even haggis. Ramsay, however, loved haggis. He could hardly wait for Nellie to say ‘BAA’, so they could eat. Nellie looked at the two hungry rams and said ‘BAA’. Calum and Ramsay ate the first haggis in seconds. Plate after plate of hot, delicious haggis was brought to the table. Twenty-five haggises’ later, the sheep were full. As much as Ramsay loved haggis, he couldn’t eat another bite. Calum, once a starving sheep, was so full that he thought he might explode, but he wanted to win, so he forced himself to eat one more haggis. Nellie counted. That was twenty-six haggises for Calum. He was the winner! He won, but was too full to move or watch any of the other Games. For all the other animals in the glen it was tea-time. They wandered over to the food stands. Tables were piled high with rich, buttery shortbread, raisin filled scones, sugary tablet, treacle toffees, sausage rolls, onion and potato filled bridies, and meat pies. Others were content to sip their tea and nibble on chocolate-covered biscuits. A horn sounded to announce the Games were about to continue. The animals went over to a cluster of rowan trees and sat down. The Sock Knitting Games were about to begin. Two ewes, Annabel and Kelsi, and one ram, Clyde, were the only three to enter. They were also the best knitters in the glen. Each brought a ball of wool, some of their own fleece, which had been spun and carded. Annabel’s was creamy and white. Kelsi’s was light brown, and Clyde’s wool was deep chocolate brown. ‘BAA’ went Niall, the judge, and the three started knitting. Their knitting needles clicked together as they knit two, purl one. The socks began to take shape. Soon all had finished their first sock. Niall gathered them and slipped them on his hooves. All three were soft and warm. Clyde finished first. His pair of dark brown socks was splendid. Annabel finished second, followed by Kelsi. The woolen socks were put on display for all to see. Later, a raffle was held. Niall walked away with the brown pair on his legs. The last event of the Games was the Highland fling. The crowds of animals found their seats in the center of the meadow. The tables had been hauled away and a wooden platform put in their place. Stewart, the bagpiper, stood, warming up. The dancers would soon arrive. Ailsa placed six swords on the ground, making three X’s on the platform, then trotted off into the audience to watch. The bagpipes began. Rianna, dressed in her green, blue, and yellow tartan kilt, stood above one of the sets of shiny steel swords. She was followed by Euphamia in her red, green, and white tartan kilt. Last on stage was Gavin. He wore a yellow, black, and white tartan kilt. All three sheep looked dashing in their flock tartans. 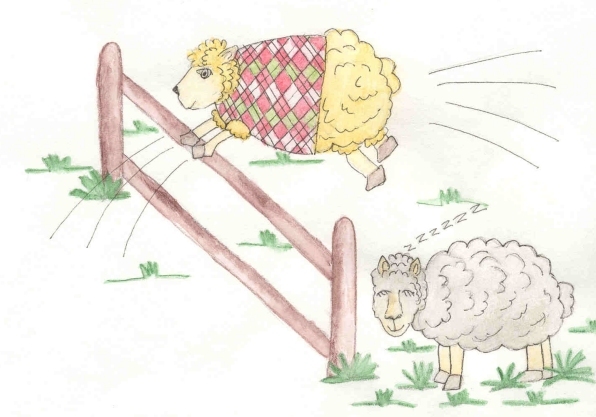 With the three sheep in place, Stewart began to play faster. They danced the Highland fling, their legs flailing about, very controlled and precise. As the music came to a stop, the crowds clapped. A winner was announced. Euphamia had won first place. The winners of all the Highland Games for that year gathered for one final applause and each one was given a trophy. This year’s festivities and games were a hit. The sheep and other animals looked forward to next year’s events.